I’m no fan of landscape fabric, but I accept that it can be a useful tool in the garden in a few select circumstances. I go into how to decide whether landscape fabric is a good choice for you in this article, but if you’ve decided to use it, I wanted to provide you with some professional tips and pointers on how to install it professionally. Add amendments to your soil. Once that fabric is down, no compost or organic matter is going to be able to get into your soil until you take the fabric out again, and organic matter is much of what keeps your soil nutritious and hospitable for plants’ roots. So take this opportunity to add as much compost and composted manure as seems reasonable for the types of plant you’ll be planting and the quality of the soil you have currently. When in doubt, use more! Smooth the soil surface carefully. Once you’ve amended your soil or added your compost, break up all clods and use a rake (I like the GroundHog) to get a very smooth soil surface, with no steep cliffs or valleys, and no rough bumps. Mulch will slide right off of landscape fabric if it’s too steep, so unless you want to look at the fabric itself (you don’t! 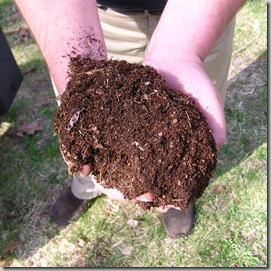 ), take the time to smooth your soil before putting it down. Select a high-quality woven fabric, not a sheet of plastic and not the thin stuff you can see through that so many hardware stores should be ashamed to sell. 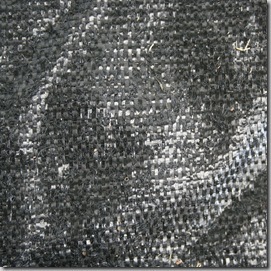 I use Dewitt brand woven landscape fabric. You want it to be a woven fabric so that water and air can penetrate. Plastic sheets and non-woven landscape cloth don’t allow your plants to get the water and nutrients they need to thrive as they grow. You also want to purchase a professional grade of landscape cloth, since the thickness of the fabric and tightness of the weave can affect how long it lasts. 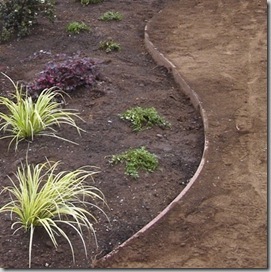 Bring the edges of your soil at least 3” below the finished grade of pathways, edging or lawn. You’re going to add at least 3” of wood chip mulch on top of your landscape fabric, so you want to have room to add that mulch without it spilling over the sides of your walkways, edging and patios. Create a smooth slope from at least 3” below where your finished grade will be, gradually sloping upwards to the middle of your beds. 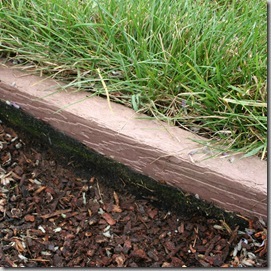 This photo shows a bed during installation that is 3″ lower on the bed side than it is on the side that will be lawn. It goes fuzzy side down. Yep. Fuzzy side goes against the soil so that it can kind of adhere to the soil surface. If you’re on a severe slope, I’ve seen people use it fuzzy side up so that mulch adheres to the fabric better. I don’t recommend that unless you really have to, because the weave on the fabric is designed to allow water to flow downward through the fabric. It still lets water through if you put it fuzzy side up, but not quite as effectively. Sides of the fabric should be folded up 1” along the edging. When you first start unrolling your fabric, place it so you have an extra inch or so to fold up on the side of your edging or pathway. Remember, you’ll have the level of your soil at least 3” below the grade of your finished edging and pathways, so if you have an additional inch of landscape fabric folding upwards on your edging or concrete, it will be totally hidden by wood chip mulch when you’re through. What this does is leave no place where weeds can crop up along the edges, because all the soil is covered thoroughly by fabric. Try to smooth the fabric so the fuzz wants to stick to the sides of your edging or concrete, so the fabric is adhering to a surface and not flipping backwards on itself. Overlap fabric by one foot. One of the most common issues I see with landscape fabric is when people have to use multiple sheets of fabric to get full coverage, and they don’t overlap well enough. You get this stripe of weeds in the middle of the bed that is very hard to get rid of. Any time you are using multiple pieces of fabric, you need to overlap it by one foot so that weeds can’t just squeeze through the gaps and grow. Use pins every one foot. 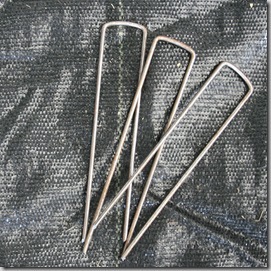 You’re going to need a big box of landscape fabric pins/ staples. Newbies often buy a few bags of 10 pins to hold the landscape fabric down, but really – you’re going to need a heck of a lot more pins than you think. Cut holes for plants, not flaps or x’s. I’ve seen a number of landscape plants that never thrived or outright died because people cut out x’s in the fabric instead of cutting away an actual planting hole. Here’s the deal: those flaps that happen when you cut an x in the fabric? They can end up wedged right along the side of the plant’s rootball and keep its roots from being able to spread in that area. I’ve pulled out dead plants to find that fully half the rootball never made good contact with the soil because one of those flaps got tucked into the soil (gophers can sometimes do this, even if us humans are careful). Even if the flaps are tucked neatly around the top of the plant’s rootball, the flaps can cause rot by holding moisture against a plant’s woody stem. 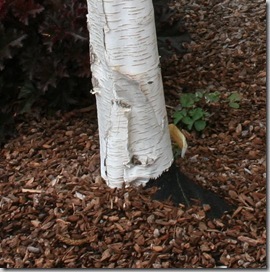 I have also seen landscapes where those flaps are waving in the wind, having worked their way out from under the mulch. Do your plants a favor and cut them out a nice hole. Be generous in cutting out holes for your plants to grow in, particularly perennials and grasses. Perennial plants like to spread out a bit, and send new shoots out from their roots. I’ve seen more than one garden where ornamental grasses or desired perennials were being choked from spreading in a polite and attractive way by the teensy holes cut in the landscape fabric for them to grow in. In ornamental grasses, this leads to a really odd effect where the grass’s base is tiny and the top of the grass is ginormously wide and flopping over. Perennial roots will choke out weeds once they are mature, so do cut out a generous hole for them when you plant, and check them every year when you cut them back to see if you need to cut more fabric away from their base for them to have room to breathe. I recently discovered the Bahco P20 Pruning Knife, and the curved blade and easy-to-grip handle has made it an indispensable tool in my crew’s weed-cloth-removal arsenal. I definitely recommend it if you want to cut clean planting holes in weed mat. Cover with at least 3” of wood chip mulch, preferably more. If light can get through to the soil, then even with a landscape barrier/ fabric, you’ll get a lot of weeds, and those weeds will be creating holes in the fabric with their roots. To prevent this, use a minimum of 3” of wood chips to shade out weed seedlings from the soil. New weed seeds will still blow in on top of your mulch, and in order to keep your fabric effective, you must pull them out before their roots get big enough to penetrate the weed cloth. It is a sad thing indeed to suffer the bad effects of using landscape fabric without getting any real benefit, but that’s what happens if you neglect the weeds to the point where they’re growing through the fabric. Even if you need to hire help, make sure your weeding gets done regularly if you’re using fabric, at least monthly. You can read more about it in this article, but when you install landscape fabric, remember that it isn’t a permanent solution. Rather, it’s a mindful choice that you’d prefer to do a really very big project in ten years to remove it and refresh your soil with compost, in order to save time on weeding in the first couple of years when the existing weed seeds in your garden’s soil would otherwise have been sprouting. Hello from Salt Lake City, UT. I really appreciate this post. We recently landscaped our whole yard and I was searching everywhere for information on landscape fabric. I also read your posts about why you hate it and when it may be appropriate and they all presented fantastic points. All together, you really helped me plan out the direction I took in our yard. In the end I decided to put down landscape fabric in some areas where there were only a few shrubs and didn’t put down fabric in other areas where there would be more growth and the plants will spread out. I used the high quality woven fabric and it was great to work with and gives me peace of mind. I bought tons of landscape pins –THANK YOU for recommending this– and I almost ran out. I cut holes in the fabric NOT the X’s, I left good space around trees and their roots, I overlapped the fabric a good 12 inches, and I folded up the fabric along the edge. I am very happy with the result and very thankful to you for your insight. It’s nice to have a real person describe the right way to do something, rather than an Ehow post. You’re now in my Google reader feed. Keep up the good work. David, thank you so much for your very kind comments! Feedback like that definitely keeps me going. I’m so glad you you were able to really use landscape fabric in a way that was appropriate to your goals. It can be useful if you know what you’re doing and use it right. Go, you! My husband and I recently finished working on a small area of the front entrance. It’s 4′ x 12′ . It was a huge pile of dirt, mud and weeds. We removed about 4 ‘ of dirt/clay, laid a double layer of commercial grade landscape fabric and then placed half a yard of 3″-4″ rocks on top. The idea is then to just place a few potted plants on top of the rocks. Today was the first day it rained since we finished our project and we noticed that water is gathering under the rocks. Is this s bad thing? Could it hurt our foundation since is right up against the side of the house? How should we go about fixing the problem if it is one? Thanks. Amanda, for liability and many other reasons (primary of which is that I am not there on site to see the actual conditions), I can’t give advice about issues like this. 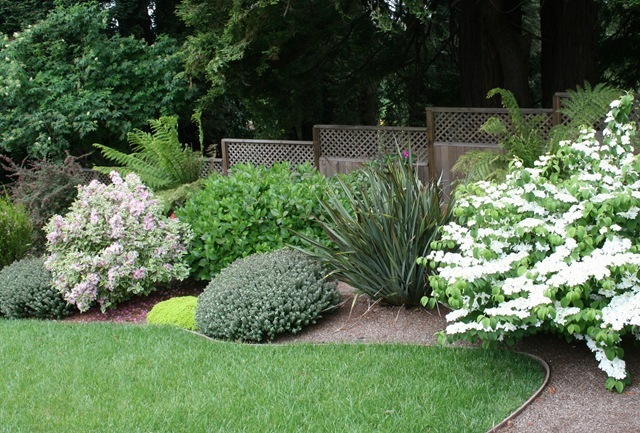 I would advise contacting a local landscape contractor for a consultation. I have a 200 square foot area of very poor soil and roots along a lakeside shore. My plan was to lay down some landscape fabric and then cover it with six to eight inches of good topsoil and turn it into a lawn. Any comments would be appreciated. Larry – do that! Just leave out the landscape fabric, as there is no need for it and it will do a lot of harm and never break down. The roots will go right through it in time and it will be a profound mess. Other than that your plan sounds great! Topdress with a half inch of compost yearly for best results into the future. How does this sound: I have a 45 degree grade about 120 feet wide and 3-4 foot deep that slopes downward from my front lawn to the hard surface county road. It is in grass which is dormant for the next couple of winter months. I want to avoid mowing the slope from here on out, so I am purchasing enough Dewitt fabric and pins to cloak the slope in multiple layers. After a few weeks I plan to cut holes and plant blue rug junipers in diamond patterns along the entire slope. Anything wrong with this picture? John, I see a lot that is wrong with this picture, but I don’t feel comfortable advising on it. Please take the time to schedule a consultation with a local landscape contractor who can advise on the particulars of your situation. Thanks so much for the advice on how to install the landscape fabric and recommending a sturdy brand. We have about 100 ft. of garden bed to prepare for planting and being up in age we can’t be out there every other day weeding. So we hope the fabric will cut down on that chore. My wife and I would like to reclaim our planting beds which are overrun with several varieties of agressive groundcover that propogate by underground tubers. We have spent countless hours trying to dig up and otherwise erradicate the stuff only to come up short year after year. Will landscape fabric be able to supress an agressive groundcover? Thanks in advance for the advice. Kevin, I wish I could answer that well, but the answer depends on so many factors that we’d need to get on the phone and do a proper consultation about it to get to the bottom of it, and that’s not a service I offer. Can I recommend that you google “garden coach” and your area and see if you can find a landscape consultant who can come out and see the area and speak with you about it? My gut is saying that no, landscape fabric will not solve your problem, it will only make it harder to solve in the long run. I think if you have not been tackling this issue thoroughly (removing every new sprout that emerges and digging any bulbs that may have become dislodged) every two weeks for two years then you have not yet exhausted what you can do manually. Once you have taken that course of action then yes, often landscape fabric can keep on top of it in future, but if the plants are still robust, then no, the plants will grow through the fabric. I have not had much success with herbicides for plants with tuberous roots like this. Good luck! Thank you so much for such a clear article. I entered “garden fabric which side up” in Google and got your site. Very helpful; I was going to use to few pins, cut an “X” and probably guess wrong on which side up, so you saved me. I look forward to reading more after I finish the project I interupted! My husband and I are slowly working on the landscape around our house. We would like to create a path between an area of ground cover and the side of our house. Would this be an area to use landscape fabric? We will be covering it with an inorganic material, but think it best to create a barrier between the soil and the rock. Are we faulty in our thinking? Any advice would be much appreciated. Would you still recommend a professional grade landscape fabric? That’s a perfect use for landscape fabric, and you’ll absolutely want a professional grade woven fabric and not that awful see-through stuff they sell at most hardware stores. Definitely don’t use a sheet of black plastic, either. In that sort of area (under a pathway with rock) I’d usually use a double-layer of pro-grade Dewitt fabric. Thank you for all the great info but I do have a few questions that I haven’t been able to find an definite answer in the endless Internet euphoria of opinions that most of the time end up in information overload and confusion. I understand the purpose of the pins to hold down the cloth but I am not so sure that using pins every foot is the right thing to do, such as on my project when I am using gravel instead of lightweight materials (mulch or straw). Wouldn’t the weight of 3 to 4 inches of gravel hold the landscape fabric down? Are pins even needed for gravel patios or paths when you overlap by one foot or when your fabric is wide enough to cover the area with one pass and edging is used? Also on certain climates, 4 seasons and soils ( Midwest / clay ) wouldn’t all those pins create easy paths/exit points for the weeds to come out as the holes will get bigger as the fabric stretches (temperature change) and breaks down. Consequently creating exit point for them to thrive. I really liked your idea of doubling the layers of the Dewitt pro 5mill fabric ( it looks indestructible ) for under gravel paths or patios, but do you put both of the fuzzy sides facing down? When you use metal edging or even plastic edging wouldn’t the right location for the landscape fabric to terminate it be on the outside (opposite side of where the mulch or the gravel was installed)? The edging than acts as the pins to hold down the landscaping fabric also it will create a better barrier against the weeds since the ends of the fabric seems to be the weakest link? What is the realistic lifespan of a gravel patio and path when you use 2 layers of Dewitt pro 5 mil before the weeds win. Every project has so many variables that I am “99.978% CERTAIN” that the average homeowner and the majority of landscaping companies will end up completing the project incorrectly. Getting the material and finding someone to do it is the easy part, finding someone to do it right the first time is the hard part. I though I had every variable considered and resolved, until I woke up this morning to find a pond where my gravel fire pit patio used to be ( insufficient drainage never crossed my mind ). I bought some goldfish for it and my young daughter thought that it was even better than before… back to the drawing board, back to digging. The depth and specificity of your questions make them outside the scope of what I can answer for you. I’d recommend discussing these elements with a local nursery expert or landscaper, or call in a “garden coach” in your area for a consultation. what about using fabric in a vegtable garden? I have 1200 ft and is always a big chore to keep weeds controled. And put straw mulch around each plant? Sounds like a plan Scott!, though I don’t know I’d put straw around the plant stalk…you’ll end up pulling weeds and little things here and there, not over the entire bed but around your cutting holes… id garden hoe the whole 1200 and pull out the junk, cut and felt, over lap and pin…as long as it’s mostly level, your fine to replace the surface with a lot choices…hope it goes well! I am getting ready to start planting in my neighborhood garden. Last year was my first time planting and I was extremely successful in growing a variety of vegetables. However, the weeds were choking the life out of my garden. The soil quality is not the best, so I wanted in invest in some landscape fabric. I am going to look into the Dewitt brand, but I wanted to know if it would affect my plants. What do you suggest? I made a garden for veggies this year and laid down landscaping fabric and added planting soil to a 10ftx10ft space. i filled the entire space with the fabric and then put the soil down. i sowed all my seeds and some are starting to sprout. I am now realizing you are supposed to cut holes?! Will the roots grow through the fabric or do i need to try and make slits through the dirt? My backyard is about 100 foot wide, but at the end where the grass stop, there is a slope down of about 10 ft (45% angle). Weed is growing and no matter what I do to get rid of it, spray, till and remove weed, it keeps coming back. I was thinking of putting Landscape fabric to cover the whole area and wanted to know if it a good idea to plant some ground cover scattered across to help hold the soil from eroding. Would plants be better? Any thought would be greatly appreciated. Thank you Genevieve; very helpful! c.
Thank you for for your very useful article. until the trees can fend for themselves. I have a stone dust pathway and the stone dust needs replenishing. Plants are on one side of the path and grass is on the other. There is no hard edge. I was considering digging down 4 inches adding landscape cloth and replenishing the stone dust. 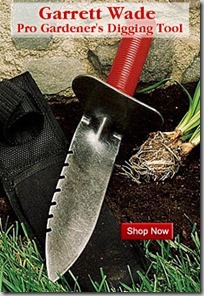 Do I need a hard edge and is this a good use of landscape cloth? Contractor states it is normal to only put weed barrier down only where weeds were growing and not over the whole area. Have you ever heard of this and is this correct? Have been building a new garden this summer with large stones and grasses in an alcove area at my church and this weekend we are laying the landscape fabric down and then the RiverRock gravel on top of that. We already have Crusher Rock stone as our base and will ensure this is level before putting the landscape fabric down. Was looking online for insight into what kind of Landscape Fabric to use and your site provided all the information I need as far as type, and how to lay down, overlap, pins etc. I had thought of going to my local HomeDepot but you confirmed I should buy a better grade and I know my local nursery in East Amherst NY carries it. I will repost when complete and tell you how it turned out..thank you so much for providing this invaluable information. Oh, thank you so much, Christine. Comments like yours keep me fired up to continue writing new articles. I’d love to hear about how your project went and any tips you may have to share after doing the work! Warm wishes to you. I am so glad to have have found your site! I am taking over the greenhouse, and planning on having the best winter garden yet. I just finished cleaning everything, down to a good power wash, eliminating cob webs and lots of banana slug poop. Clover loves to grow in the soil, and this year the nettles were getting out of control. I have decided to use weed mat. Is it a good idea to have the drip line above the mat? That is what I assume, but I have heard of doing it both ways, what do you recommend? The greenhouse will be full of yummy winter vegetables and herbs, if you have any tips for me, I would greatly appreciate it! Imagine a fully prepared and dug-over veg. plot . What do you think of covering it with fabric for some of the winter months to try to avoid having to do too much weeding in the Spring? I’m an old man and live in 2 countries; the veg plot gets no attention during the winter. I’d appreciate your advice. Thank you. I suspect this will make your live a LOT easier come spring as you won’t have weeds on the ground. I’d also be tempted to try and lift it in the early spring. lets weeds germinate then recover for a further 2 weeks. That will depletes the weed seeds in your soil. I have a fenced garden 80′ x 35′. I garden solo, with an occasional cry for help… “Women Wanted to Weed on Wednesday for Wine” … got me 3 girlfriends for a day of weed eradication and fun. This year, I accept it is out of my capability unless I create some labor-reducing features. I will put in 8 raised beds separated by pathways. The beds are 15″ high, and will be filled with amended soil. Also, I will put wire screen on the bottoms to keep out the gophers and other burrowers. So, I plan to put down landscape fabric or road fabric on the pathways and cover it with wood chips freshly mined from my surrounding woods. As the chips breakdown over the years, I’ll amend the bed soil with it, and add new chips to the paths. Road fabric comes in bigger sheets, so less waste with overlapping. But, it’s made for roads, not edible gardens. 1. What is road fabric made from, and will it leach toxins into the soil? Is landscape fabric made from the same material? 2. Should I lay it under my raised boxes? The bed soil will be about 14″ deep and I think adequate for the vegetables I plan to grow. Please also comment on my plan. Thanx… your posts have already been hugely valuable. I don’t know about the chemical composition if the road fabric… but as far as putting fabric under your raised beds– I wouldn’t, because earth worms do a lot of good for growing vegetables, and they will be unable to reach the roots of your plants. I would however make sure there aren’t any major weeds wherever you put the raised beds. By this, I mean things like briar, root-to-china bulbous vine monsters, or undead tree stumps of the zombie camphor tree variety which scoff at our wimpy control attempts. I have a 10×30 vegtable garden…this is the 3rd season. I’ve already tilled. Last year I had more weeds and grass than I could handle. We had sooooo much rain in VA last year, I didn’t have to water once. 😉 I’ve never used landscape fabric, but want to try it this year. Couple questions….you talk about “cutting the holes”, do you cut the holes the size of what the plants are going to grow to or the size they are when you plant them? Do I only mulch on the fabric, or can I mulch up to the plant itself? Thanks in advance for the advice. I cut the holes to fit the ultimate size of the plant, unless you think you are together enough to come back each year and cut away a little more fabric (you’d be a rare individual if so). 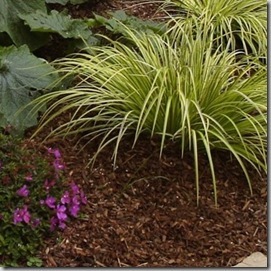 You can mulch over soil as well, but don’t cover the trunk or stems of the plant. How far should you extend the landscaping fabric to the edge if you’re not using an actual “edging material”. We just cut ours out, and in the past, the mulch winds up getting raked back under the fabric. If I cut it too short though, the weeds creep into the edge of the beds. Suggestions? I am building a new house on a lot with a big hill that needs stabilizing before it washes out. The hill is over 70 feet long, 30 fee high and quite steep. I don’t want to even think about planting grass and mowing! Am looking at ground covers to stabilize the soil, but a friend recommended landscape fabric. I haven’t liked it in the past and read your posts. What do you think about stabilizing a hill? We’re laying landscape fabric down in a playground with wooden structures, then covering with rubber mulch. Plastic beams will enclose the area. You mention raising one-inch of the fabric against the barrier. For the wooden structure, should we staple the fabric to the wood or just leave it loose? I assume we will put pins very close to the beams and structures for stability of the fabric. We are getting ready to build a new flower bed about 45′ long and 5′ deep 🙂 I am not a fan of landscape fabric, but feel I need a little extra help controlling any grass/weeds. We are wondering if it is a good idea to till before laying the fabric down? I say yes, but so many others I talk to say don’t waste the time….. I live in central Florida. We have a struggling red maple, Acer rubrum, in our right-of-way area between sidewalk and street. The two other red maples of same age 20 feet left and right of it are prospering. The turf grown right up to the trunk. We want to fertilize the struggling maple but not those pesky weeds and grass! So my idea is: (a) clear turf for a good 6 – 8 foot diameter, (b) fertilize, (c) lay down a layer of newspaper or grocery bags, (d) a layer of black landscaping cloth with good sized hole, (e) mulch 3 inches except next to the trunk. After a month or two, rake away mulch, remove landscaping cloth, then pile mulch back in and continue to keep weeds out. We recently had a drainage issue addressed across the front of the house. The house is on a downslope, and there is a walkway that runs across the front of the house between the house and the front lawn. leaving a curvy bed across the front of the house that varies between 4-10 feed in depth. In that area, we had a contractor install a drainage system that included multiple catch basins and shallow swales (up to 3″) in the beds to direct water to the basins. We are going to rock the front beds using river rock. I’ve installed landscape fabric, using your advice on quality, overlapping, etc. (thank you!). I’ve made the overlaps in a way that, given the drainage swales, water would not run “under” the overlaps. In some cases, though, for a part of the length of a strip of fabric, the overlap is in the “correct” direction for the most part, but some parts it’s “incorrect” because of the ways the various (shallow) swales were cut. How do folks handle this? Will the landscape pins and the weight of the rock make this concern a moot point? Does one “tape” the incorrect overlap? Can you “cut and tuck” just those few areas to switch the overlap? Hope I’ve explained this correctly! [If it helps, I’ve also cut X’s in the fabric for the grates on the top of the basins, trimmed some excess, tucked them into the top of the basin and then re-installed the top grate. I’m considering using landscape fabric under a new 9′ x 17′ deck at the rear of my home. Would this be a good idea? If so, what grade would you recommend? If not, any other suggestions? 1) This article is fantastic. A MASSIVE help. 2) What length of pins do you use? I assume pin length is based on soil composition + grade? In my case, most areas are flat and the soil is a mixture of black dirt and clay… though it is predominantly clay. I was looking at 6″ pins – but I see that DeWitt also has 8″ and 12″ (which seems a bit much). Thanks for the fantastic post! John, all I can get locally are 6″ pins, which do fine. Hello, this post has been extremely helpful in many ways. I don’t know if you are still responding to questions and comments Gen, but i have one myself that i am not sure has been asked yet or not. I am helping my mother to her yard in shape and I want to stop weeds from growing in the yard. What I am doing is tilling the dirt, putting landscape fabric about 6-8 or so inches under that ground dirt, then covering it back up. The dirt has no good quality to it. After I put the fabric down where I want, I plan to plant on it later on using trees, bushes, etc. I suppose my main question is, is what depth is too deep to put the fabric down? If it is 6-8 inches deep will it be effective to still help prevent weeds? Thank you for all this help regardless if you get to responding or not! Hi Gabriel, putting soil on top of landscaping fabric totally defeats the purpose, and will keep trees and shrubs from thriving as their roots can’t easily penetrate it. Please don’t do that! Either use the fabric on top of the soil, or skip it entirely. Hope that helps. My hope for doing this is to keep weeds out. As far as planting goes I have cut holes in the tarp and then planted the trees. Will the fabric keep weeds from growing for the most part at this depth? My previous soil was really bad, it was abandoned for over ten years with nothing groing in there, except for some wild weeds that couldn’t even penetrate the hard dirt. The previous owners used salt, and other chemicals to kills some tree stumps which left the soil unusable. When i bought the house, the plan was to build a lawn on it, i also did not like the tree stumps so, what i did was buy fabric, lay the fabric down and put 6″ of dirt on top of it. It worked out very well. It was hard at first for the lawn to establish because the dirt was very fluffy but right now it is on it’s second season and still beautiful and thriving. Thank you very much, i really appreciate the feedback. I have done it to a lot of the property already now and was hoping for some reassurance that I wasn’t wrong on my decision, thank you. Do not cover your weed fabric with 3 or 4 inches of soil. Your weeds will love you for it! I have been in horticulture since 1974 and I have not seen anything like I have at the house I just purchased. There is grass and weeds everywhere. I have been uprooting and killing all this to make way for flower gardens. Unfortunately, I have found weed fabric everywhere! It was put down and covered with 3″ to 6″ of dirt so it is basically a grass and weed garden. Grass, dandelions, crabgrass and a lot more unwanted plants can live in 3 inches of soil. Put down the cloth and cover it with mulch, do not cover it with soil and then the mulch you will regret it (as I am)! Thank you for your great article. It’s concise yet full of useful info and helpful photos. I live in drought-plagued California and took advantage of our recent unusual July rain by digging up the rain-softened strip that separates the sidewalk from the street. It was made up of grass and weeds…and many bald patches. I plan to lay landscape fabric and 3″ of mulch after sifting out the clumps. But because we will experience near triple-digit temps for the next few months, I don’t want to transplant anything to the strip now. I want to add a few drought tolerant plants this coming spring. Is this doable/recommended? How much of a pain is it to put in plants “after-the-fact”? How-to steps or tips are appreciated – thank you! Can you make a recommendation for me? I am very new to gardening and don’t have the help of a partner. I have a slope in my hard, not severe, but enough that mowing it is hard and dangerous. My goal is to cover the grass with fabric and then eventually put mulch or groundcover/drought plants. We live in Washington, by the drier east side. I just want to be free of mowing it because it is difficult for me to do well. Getting plants in is secondary to me, but if I need to wait a season for the grass to die, I am happy to wait too. I am in a holding action with a 30′ x 35′ area (with about a 30 degree slope from one corner) behind the house I have begun remodeling; eventual vegetable varden (primarily raised bed) planned, but one year plus out. Can a single layer of weed fabric be placed on the surface exposed to the sun and still significantly retard a crop of windblown ‘native grasses’/weeds, or is a mulch or other layer required? Thank you for your great tips on using weed fabric. I have a question, I am creating a dry rock bed across the back of my yard, this are has a 4′ natural stone wall next to it. I plan to scatter some Texas wildflower seeds in the rocks. Do you think that I need to put some dirt on top of the weed fabric for the wild flowers since the weed fabric will be there? I have just gotten landscaping done at my home. I watched them put down a thick plastic over the ground before placing the dirt. I was wondering how would the plants grow into the ground after awhile. 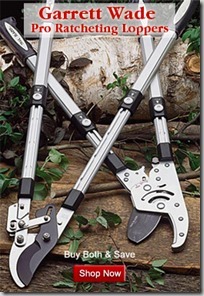 I began researching this and I have not come up with anything I wanted to hear after spending 3000.00 on landscaping. I guess i just want to know if my landscaping will last, or is it just matter of time before everything dies? I am looking for a temp option to cover my backyard dirt while I figure out my landscaping options. Is covering the dirt with landscape fabric a bad idea? Hi there, two years ago I planted a drought tolerant garden in my front yard. To prepare we removed the top 3-4 inches of soil to remove the grass which was still alive at the time. The lawn was a mix of grasses among which was crabgrass that has roots about 12″ deep. The crabgrass has taken over my garden despite the 3″ of wood mulch that was put down at the end of the project. No matter how much grass I remove it always comes back because the roots are so deep. A friend said she had good luck layering wet newspaper with mulch on top. She said it composted the grass and it never came back. Will this work with crabgrass? Should I put down extra mulch, say 10″? I tried landscape fabric in one section of the yard and it did not help much, though I did this before I read your wonderful recommendations in this post…I have planted a variety of species that will hopefully grow quite large and fill the yard for a “cottage garden” look. I appreciate any suggestions you may have. Good article but I am not planting just want to make a walkway with stone with walking brick steps. I was thinking of using black plastic and maybe double it? Will that keep weeds from growing threw ? Or maybe triple the layer of application? I realize I’m a little behind the times here, but I’ve referenced this article several times – just in preparation for setting up my mother’s front yard – which we need to be relatively low maintenance, at least for a little while. I was thinking I could run down to Home Depot for the Dewitt pro-grade fabric, but it now occurs to me that perhaps what you’re using is not available @ Home Depot, because it’s a higher quality. Could you suggest some place which would carry the pro-grade fabric you’re recommending? I would really appreciate it! Thanks for all the bits of wisdom you are handing out!! Hi Dawn, I definitely favor the pro grade of Dewit. I think as long as it is dewit brand and woven, not solid with air holes punched, you will probably do fine. The dewit website does detail the relative grades of fabric and so might provide insight as to the quality of the stuff at Home Depot – dewit shares the number of years each grade will hopefully last with good care. That might be helpful research to do. I am honestly not sure what the grade is of the stuff I use, as I buy in bulk locally and have always been very happy with the thickness and quality. I know it is one of the pro grades but not sure which one. Hope that can help a bit!! Thanks for the article. I’ve just had my yard scraped and terraced and new soil brought in. I don’t think I will have time before the rain sets in (I live in Oregon) to plant and mulch. Can I leave the landscape fabric exposed during the winter over the new soil to reduce erosion and keep new weeds at bay?